Effective Immediately: The Rio Blanco Sheriff’s Office has issued a pre-evacuation notice for all residents along County Road 10 south from the County Road 17 and County Road 10 intersection. There is a public closure of County Road 10 (residents only) starting at the intersection of County Road 10 and County Road 17. All trailheads and campgrounds in the South Fork drainage on the Blanco Ranger District are now closed. Update: Over the past day and a half the Cabin Lake Fire received an influx of crews, multiple engines, heavy equipment/machinery to support suppression efforts on the fire. Public and firefighter safety and structure protection remain top priorities on the Cabin Lake Fire as multiple hand crews, engines, heavy machinery and aerial support continue to aggressively suppress the fire. 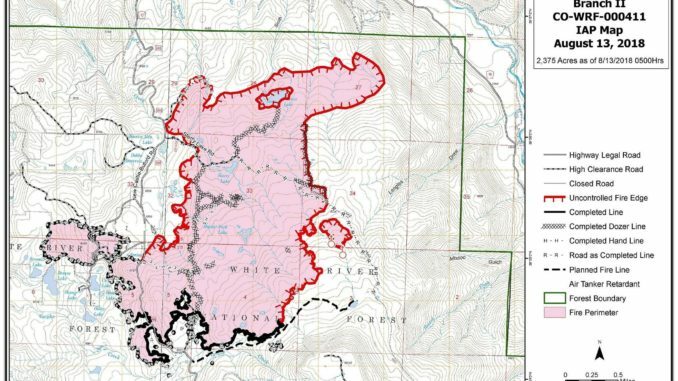 At 11 p.m. last night, the Cabin Lake Fire experienced a significant wind event with gusty/erratic outflow winds, which increased fire activity and pushed the fire north and east past Balloon Lake. This part of the fire is now threatening structures, however no structures have been lost. Firefighters and engines patrolled and engaged the fire as safety allowed, throughout the night. 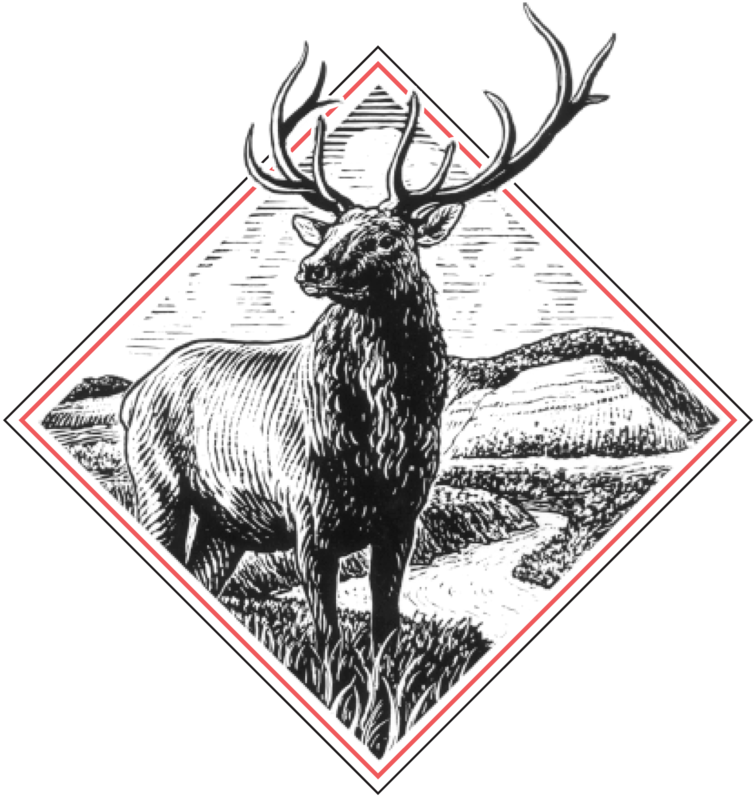 Rio Blanco County Sheriff Mazzola issued an emergency evacuation notice at 2 a.m. this morning to the residents in the area south of South Fork Road toward Burro Mountain southwest of County Road 10 using Rio Blanco Alerts and direct, door-to-door contacts. Additionally, the Rio Blanco Sheriff’s Office has issued a pre-evacuation notice for all residents along County Road 10 south from the County Road 17 and County Road 10 intersection. The pre-evacuation warning for County Road 17 remains in effect. There is a public meeting scheduled for 6 p.m. tonight at the Buford School regarding the evacuation. There is a public closure of County Road 10 (residents only) starting at the intersection of County Road 10 and County Road 17. All trailheads and campgrounds in the South Fork drainage on the Blanco Ranger District are now closed. The Buford New Castle Road remains closed at the County Road 10 and County Road 17 intersection and south to the Meadow Lake Campground Turnoff (Forest Road 601). Today, multiple engines and firefighters will continue to focus on structure protection efforts throughout the fire area, prepping structures by clearing vegetation where needed and assessing possible sprinkler placement. 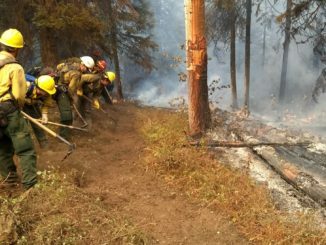 Hand crews, including two hotshot crews, are working directly on both sides of the new fire growth to aggressively suppress the fire by building direct hand line utilizing dozers, saws and hand tools. Ground crews are working in coordination with aerial support which will utilize water and retardant drops to check and slow fire spread. Additionally, crews will continue to utilize a previous burn scar located on the eastern flank of the fire to establish dozer line. 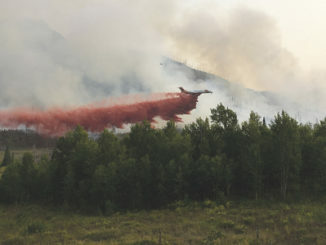 Air Resources such as Single Engine Air Tankers, Large Air Tankers, a Type 1 Helicopter and a Type 3 Helicopter will be used throughout the day to drop water and retardant in coordination with ground crews. The fire is expected to be active throughout the afternoon and into the evening with isolated and group tree torching. 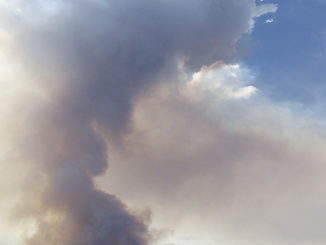 The weather is expected to increase fire activity in the afternoon and early evening and create large amounts of smoke. Smoke is drifting south, east and west and is visible from Buford, Meeker, New Castle, and Rifle, Colo. Gusty/erratic outflow winds are expected again this afternoon and evening with an approximate minimum humidity of 17-22 percent with highs 74-79 degrees Fahrenheit. Night Operations will continue tonight with engines and firefighters patrolling control lines and structures throughout the fire area. 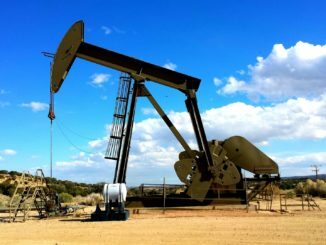 Structures remain threatened, but no structures have been lost. Evacuations: Rio Blanco County Sheriff Mazzola issued an emergency evacuation notice at 2 a.m. this morning to the residents in the area south of South Fork Road toward Burro Mountain southwest of County Road 10 using Rio Blanco Alerts and direct, door-to-door contacts. The pre-evacuation warning for County Road 17 remains in effect. Additionally, the Rio Blanco County Sheriff’s Office has issued a pre-evacuation notice for all residents along County Road 10 south from the County Road 17 and County Road 10 intersection.